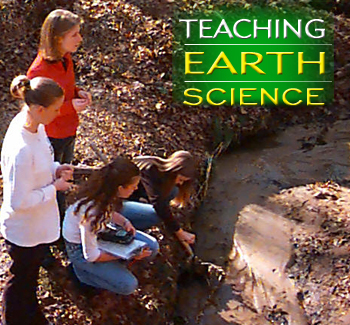 How a group of determined people in North Carolina worked 15 years to make earth science a graduation requirement in the state's high schools. Discussions about improving how we teach earth science in the United States have been going on for at least a century. It is time for the earth science community to try a new strategy. Last year, Texas earth scientists discovered that their state school board had taken earth science out of the curriculum. The geoscience community quickly mobilized. Educators are working to ensure that earth science is taught well and that every student has a chance to learn it. What's in a law? Not as much as some Ohio creationism advocates assert. A partnership between a consulting company and an elementary school introduces professional geologists and students to each other. Photo montage: High school students from East Lincoln High School in Denver, N.C., monitor a stream on their school grounds (two left photos); Texas State Geologist Scott Tinker gives Austin students some earth science knowledge (check Web site for story later in month). Background photo: Hanging Rock, Sequoia and Kings Canyon National Parks, California. From Geotimes files.